Buying frozen corn like this saves time and money. I love having it in the freezer for when i’m making fried rice or a stir fry. I happily add corn kernels to most recipes because I just love the taste of corn kernels and Birds Eye corn kernels are seriously sweet and delicious and nutritious! Hot or cold my girls love these corn kernals they are sweet and delicious in salad or in pasta or as a side with a hot roast! I always have corn kernels in the freezer. I use them in salads and myMexican bean dish. Birds eye are the best quality. Always juicy and sweet. They are a bit more expensive than other brands but you get what you pay for! These are super sweet great tasting corn kernals. With the added bonus that they are Australian. I only buy birds eye frozen vegetables because the quality and taste is far superior to other brands I’ve tried. Great to tip into a bowl and microwave. I’ve also stirred through tuna bake. Cost effective and the super sweetness is a hit with the kids. Birds Eye super sweet corn kernels are a delicious sweet corn delight that is fab with meat and veggies,love the flavour of the corn.Very delicious. So glad i finally found an all Australian product. These taste great. I use them in my salads and spuds. Always juicy and full of taste. These are so tasty and I use them in everything! They are firm and fresh tasting, not soggy, however the only downside which is super picky is sometime you get a bit of hard dried corn in there, but very rarely. These really are super sweet frozen corn. So much easier than fresh, and can eat them all year around when fresh is not available. Would recommend! This is my favourite frozen corn. The kernels are always just the right level of ripeness and never old, flavourless or dry. Most of the time these kernels are tastier than supermarket “fresh” corn which is unreliable. I always have a bag in the freezer and it’s so convenient to throw into soups and stews. 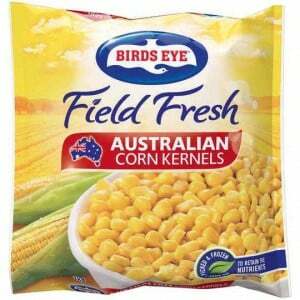 How would you rate Birds Eye Corn Kernels Super Sweet?